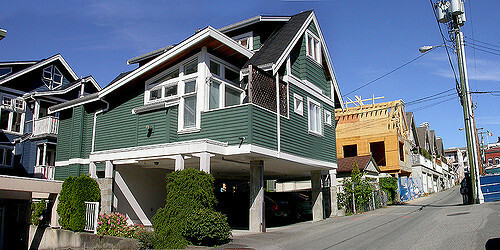 Secondary suites are becoming more and more accepted as a form of housing, especially in Vancouver, where they're often known as "laneway houses". You might also have heard them called coach houses, granny flats, garden suites, or guesthouses. Adding a secondary suite to a home can cost up to $300,000, but for many families (and family members), that can still be more feasible than purchasing a new, separate home. Other benefits of a suite include having your family together, but separate, with the privacy and financial security implied therein. There are some potential downsides to suiting. Ownership of a suite can't be divided from the initial home, so the title will remain with the principal home owner, which isn't always an ideal situation for the tenants. That said, more and more financial institutions are coming up with new financing systems that acknowledge the family dynamic often involved in a secondary suite. If you have a suite in your home, the homeowner also automatically takes on the title of landlord, and is subject to the bylaws and potential pitfalls that come with the position. Educating yourself on the rules and tenant rights is key. In Canada, most residential tenants are covered by a provincial or territorial Residential Tenancies Act. However, there are exceptions to who the Act applies to. In most provinces, including BC, landlord-tenant laws have exemptions for rooming houses, boarding houses, and rooms in landlords' houses. In BC, a tenant who shares a kitchen or a bathroom with the homeowner or the homeowner's family is not subject to or protected by the Residential Tenancies Act. In these cases the tenant has no right to live on premises without the homeowner's consent, and they can be evicted without notice. By the same token, the landlord is also not subject to the Act. That means it can be more difficult to get reimbursed for missed rent, or other minor issues that can arise with a young tenant. If your child is sharing a kitchen or a bathroom with your household while renting from you, in absence of the Residential Tenancies Act, it is strongly recommended that you have a written agreement (on paper, not email or text) dated and signed by the both of you. This agreement should cover the tenant's rights and the course of action in the event of several circumstances, including if the tenant is forced to move out early or if the landlord needs to dispose of the tenant's property. As with co-ownership, it isn't guaranteed to solve all problems down the line, but it can make a difference if you find yourself having to resort to a legal clinic. The need to provide 24 hours advance notice or obtain permission before entering the tenant's unit, except in an emergency. The responsibility to ensure the unit is safe, habitable and in good repair: No mold, no violation of housing codes, no broken appliances, no leaky pipes, no peeling paint, no pests, sufficient heat and A/C, etc. This is an ongoing responsibility, not to be undertaken only when the tenant complains. That tenants are responsible for unit cleanliness, and the repair of any damage they or their guests cause. That tenants can change the unit locks if they can prove the landlord is illegally entering. That when the tenant moves out, their rights will depend on whether there was a lease and whether the landlord was given proper notice. ...And many more. You may want to go over the Act as a family, and hash out an additional written agreement for any exceptions or unusual circumstances that may apply to you. Aside from the rights and responsibilities of being a landlord, you'll also need to assess your standing with the CRA in terms of rental income. Whether you have to declare the rental payments you receive on your taxes depends on whether or not you're charging fair market rent. To start with, if you are making rental expense claims on your taxes, you can only claim the percentage of your home that's dedicated to the rental property. For example, if your home is a total of 2,000 sqft and 800 sqft of that is dedicated to a rental suite, then you can only claim 40% of your home's expenses. You can also only deduct expenses if you incur them in the process of earning income, which you must report in your taxes. If you don't declare your incoming rental revenue as a source of income on your taxes, you can't claim expenses either. But you especially can't claim expenses or a rental loss (and may not have to declare your rental income) if you're charging rent below what's considered fair market value. Renting below fair market value is when you rent your property to someone you know (usually a family member or friend) for less than you would to a stranger. This includes cost-sharing situations where your tenant pitches in for groceries or other shared household costs, and cut-rate rents where you charge fair market rent and then turn around and give your tenant money. If you really need or want to be able to claim your rental income and expenses, make sure to charge your family member a fair market rent. And if you still want to reduce the rate (by a reasonable amount) somehow, just ask your child to put in some work upkeeping the property, and all should be well.